I am pretty sure today was my best shopping trip yet. It wasn’t the biggest savings wise but I feel like I got some pretty good prices and on some food items. So far I have only been getting toiletries and cleaning supplies so it was nice to get something we can eat! It was a bunch of processed foods, like cookies and crackers but these are going to come in handy over the holidays. I am really excited about today’s trip – seems like a weird thing to be excited about? Most of the coupons were inside the What’s Cooking Magazine found inside my Kraft Samplicious Box – so unless my post says otherwise, that is where I get the coupon from. I did my shopping at Save on Foods, everything I bought was card price PLUS I got to use an in store coupon, save $5 when you buy 5 Kraft products. The store I went to didn’t actually have any of the new coupons but they let me use an old one that they found. Awesome customer service! Between today’s shopping and my Kraft Samplicious Box I am pretty well stocked in Kraft products haha. This entry was posted in canadian coupons, coupon stacking, coupons, food, free, save on foods, walmart and tagged canadian coupons, coupon stacking, coupons, kraft, save on foods, walmart on November 20, 2011 by Courtnie. Third time is the charm. I have tried to do this stack three times now and finally had some luck. I guess this was actually my fourth time – I had two stacks of coupons to get two free Scrubbing Bubbles 1 Step Toilet Kit. The first time went great – they took $10 off the $9.98 price – no problems or questions asked. Trying to get my second free one is when things went downhill. First try, I went to a different Save on Foods and was told they don’t stack. Second try, I was back in the Save On Foods where I got the first, I was told I couldn’t use my coupons because my coupon value exceeded the price of the product. Today I was back in the same Save on Foods where I got the first one and was turned away because my coupon value was too high. Today they took my coupons, didn’t say a word and price adjusted it down 2 cents. Still find it so weird how every cashier is so different. One took them and gave me the full $10, one wouldn’t take them and told me they couldn’t get adjusted and the third adjusted them down to $9.98. All in the same store. Anyway, I have my Scrubbing Bubbles now and I can stop looking and trying. 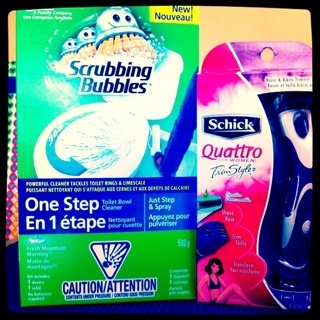 Also, on sale I found a pretty cheap Schick Quattro for Women TrimStyle – thought I would try it out! This is the shaver I normally use, so I already have the blades. Figure it can’t hurt. 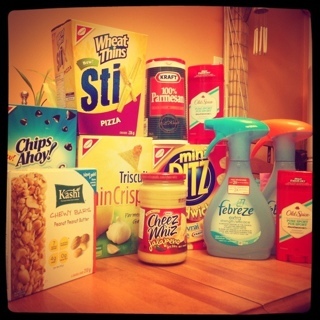 This entry was posted in canadian coupons, coupon stacking, coupons, free, save on foods and tagged canadian coupons, coupon stacking, coupons, free, save on foods on November 19, 2011 by Courtnie. I just assumed that all Save On Foods would be the same in their coupon policies. I am not sure why I though this but anyway it is not true and I found it out the embarrassing way… or the hard way however you want to look at it. I didn’t end up getting it and I was kind of embarrassed about the whole thing but it was my own fault. I just didn’t realize that each store in a chain would have that different of policies. Lesson learned, always check the coupon policies for EACH INDIVIDUAL store. Thankfully I don’t typically shop at that Save On Foods and is it the farthest from me – I just happened to be in there. Of course after I got home I googled and read the policy and saw that it is different from store to store. Hopefully this helps someone else from making the same mistake I did – call your local store and check if they allow coupon stacking before you go! This entry was posted in coupon stacking, save on foods and tagged coupon stacking, save on foods on November 15, 2011 by Courtnie.